After a brief hiatus with the expansion and renovation of Burdick Hall, the Baltimore Rampage Climbing Competition returns for its 14th year! An Outdoor Adventures tradition, the Baltimore Rampage opens its doors to students from Towson University, as well as other institutions in the area. Climbers of all skill levels are welcome to join in on the fun! The Rampage features three different skill levels: recreational, intermediate, and advanced in both men's and women's categories. All climbs are top rope. 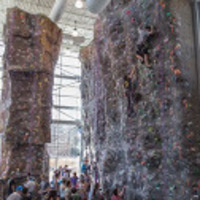 The climbing begins at 11 a.m. and runs until 4 p.m. Prizes will be awarded to our top climbers, as well as the series winners for the Mid-Atlantic Climbing Competition Series. Door prizes will also be awarded at the end of the day.